From German author Hagena, the story of a young German woman whose inheritance of her grandmother’s house leads her to plumb her family’s past. This book was an international best-seller. 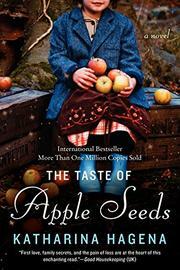 In Bulloch’s translation from the German, nature imagery is colorfully transcribed, which is fortunate, since Hagena’s descriptions of the lake, forest and gardens surrounding the ancestral apple farm of the Deelwater family are among this novel’s principal charms. Bertha, the matriarch, who survived her husband, Hinnerk, by many years—most of them in a state of steadily worsening dementia—has died, willing portions of her estate to her three daughters, Inga, Harriet and Christa, and, unexpectedly, bequeathing the farmhouse to Christa’s daughter, Iris, the narrator. As Iris, a librarian, takes time off to decide whether or not to keep the house, her recollections and encounters with denizens of the tiny lakeside village of Bootshaven shape the novel. Family secrets are mulled over as Iris’ consciousness, searching for clarity, circles back repeatedly to crucial events she witnessed as a child. Herr Lexow, elderly caretaker of the farm, confesses that he might have fathered Inga during World War II while Hinnerk was off at his job as a prison camp commandant. (Hinnerk’s checkered past with the Nazi Party is not a major aspect of the novel—the primary focus is on the women’s comparatively sheltered lives.) Whimsy abounds, striking a discordant note with the overall meditative tone of the book—for some reason, Iris’ wardrobe is limited to old ball gowns once belonging to her aunts; she and Bertha’s lawyer, Max, meet cute while swimming naked in the lake; and Aunt Inga, born during an electrical storm, cannot touch anyone without shocking them. Aunt Harriet, now a devotee of an Indian guru, had her heart broken, and the child born of this liaison, Rosmarie, died under circumstances not fully elucidated until the novel’s climax. Since much of the nuanced wit is perhaps lost in translation, what remains is a decorative but aimless family chronicle. Matriarch Bertha’s decline is, however, viscerally felt and vividly detailed.